St. Patrick’s day is here, and with the plastic shamrocks popping up in stores everywhere, it got me thinking about the real plant, which grows everywhere around the world, and is under attack with a vengeance by the city government in San Francisco. Oxalis, Sourgrass, Wood Sorrel, Bermuda Buttercup, Shamrock, and False Shamrock – these are just a few names for a genus of wildly prolific edible plants (aka “weeds”) which grow everywhere around the world. Even if you aren’t familiar with the name of this plant, you’ve likely encountered the clover-like leaves and pretty yellow wildflower of oxalis in a lawn before; it infiltrates grassy areas everywhere, street medians and even sidewalk cracks in cities ranging from New York and Cape Town to Sydney and San Francisco. Children love to eat it and play with it, and most school kids are familiar with “sourgrass”. 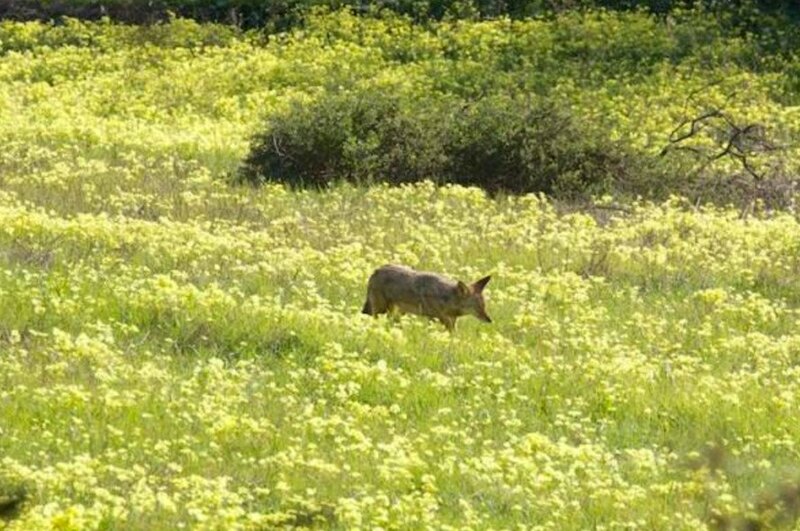 In January and February, entire hillsides in San Francisco burst in vivid yellow bloom with Oxalis flowers. Whether this is a problem or not depends on who you ask. 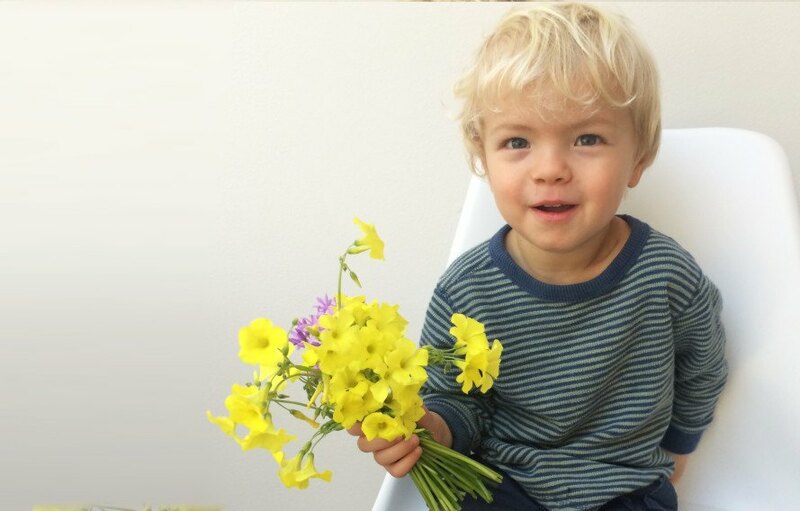 Many San Francisco residents see the hillsides of bright yellow flowers as a beautiful first sign of spring, whereas others, especially those who espouse a nativist point of view, see this plant as an “invader” that must be stopped at all costs – even when that environmental cost includes dousing entire hillsides in dangerous pesticides such as glyphosate and triclopyr. 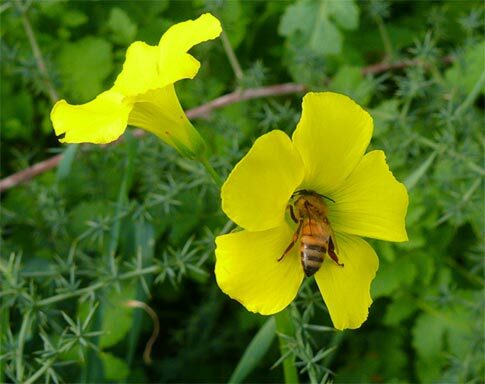 What Sigg doesn’t mention in this quote is that there are many pollinator species, including honeybees, bumblebees, and other types of butterflies, that forage on oxalis nectar during the winter time of year when no other flowers are blooming, and could be harmed by the herbicides sprayed on these flowers. So, in the interest of trying to protect one butterfly species (the Mission Blue Butterfly), San Francisco’s Park and Rec department has apparently decided it is an acceptable tradeoff to poison other pollinators that are important to local ecology and human agriculture. In a Bay Nature Magazine article, Doug Johnson, executive director of the California Invasive Plant Council says there is just no point in trying to wage war against oxalis. “It’s not a target for landscape-level eradication because it’s just way too widespread,” he said. In oxalis’s case, the benefits that would accrue from fighting it on all fronts aren’t quite enough to justify the costs—there’s just not enough time or people to dedicate to the effort. (Not to mention that eliminating oxalis takes a doggedness that even Sigg describes as “fanatic.” He managed to eradicate it from his garden, but it took him five to six years, and he sometimes had to comb through his plants by hand.) Instead, Cal-IPC focuses its efforts on the battles that can be won: new, potentially dangerous weeds that can be stopped, or existing weeds that threaten valuable resources. I visited some of the areas that had been sprayed with Triclopyr recently and the results were not impressive. The fields of bright yellow flowers were not gone, just missing in little patches here and there. It is easy to see how it will immediately grow back. California native Oxalis Oregana, growing right next to “invasive” yellow oxalis on a San Francisco city street. The question around what is “native” and “non-native” seems like an arbitrary and potentially slippery debate as it often taps into deeply held xenophobic sentiments about what is valuable, and what should be allowed to thrive in a given location. That said, I find the discussion around “native plants” versus “invasive species” to be particularly fascinating and confusing when it comes to oxalis. It is often the claim of native plant advocates in any location, that oxalis is an non-native invader that needs to be eradicated. The truth is that oxalis grows all around the world, and there are many species of oxalis that are native to California, including Oxalis Californica (Yellow Wood Sorrel), and another forest-dwelling species with whitish lavender flowers called Oxalis Oregana (Redwood Sorrel). Oxalis has been growing in California for thousands of years, and the original native people of this country – the American Indians – widely ate both its leaves and bulbs. There is a species of oxalis from South Africa (Oxalis Pes Caprae), which is the invader that native plant advocates will tell you that they are doggedly fighting in San Francisco parks, but to an untrained eye (like mine), this plant looks exactly the same as the native yellow oxalis. When I was living in New York City, we had a yellow flowered oxalis “weed” growing everywhere that looked pretty much the same as both of these other species, but naturalists in that area called it Oxalis Stricta, which is native to North America. Different species of native and non-native oxalis – can you tell the difference? And does it matter? I suppose plant experts can distinguish between these different types of oxalis, but can your average gardener or pesticide applier? And what specifically makes a native plant “a weed”? It seems there is no scientific definition of the word “weed” – it is just a term used to designate prolific plants that reproduce quickly and sprout up in locations where they are not wanted. And in public lands – who determines if a plant is wanted or not? That is the heart of the fierce battle now waging between native-plant advocates and anti-pesticide activists. Oxalis Pes-Caprae (South African Oxalis) reproduces underground with little teardrop shaped bulbs, so just killing one plant doesn’t kill the underground bulb, which just spreads and pops up somewhere else – much to the dismay of gardeners who like to keep their gardens oxalis free. This plant is literally everywhere – including sidewalk cracks and highway medians, so it really is impossible to get rid of. And is that necessarily really a bad thing, I would ask? Wood Sorrel doesn’t just have aesthetic value with its sunny yellow flowers, but is also useful as an edible plant. I first learned about this cute little weed from renowned New York City foraging guide Wildman Steve Brill, and then discovered my kindergartner was picking and eating it every day at school in New York City. “Oh that stuff? We call it sourgrass, mom” he told me. Now that I live out in San Francisco, both of my children are very fond of oxalis and encounter it every day; in our backyard, surrounding sidewalks and parks in our neighborhood, and at their outdoor schools. We see both the native lavender variety (Redwood Sorrel) and the yellow flowers. 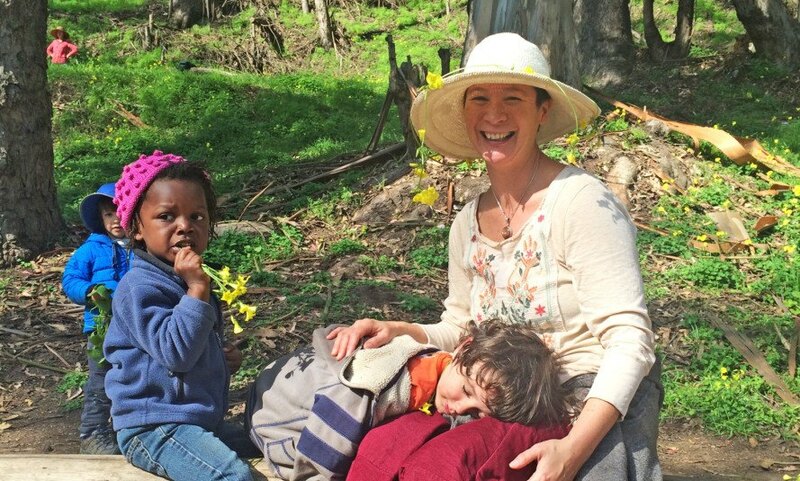 Both of my kids are in an outdoor forest school in San Francisco’s parks, so they spend their all of their days playing in nature. Kids are naturally drawn to the vivid yellow flower, and I’ve found them making buttercup daisy-chains, using sourgrass as currency in some complicated grade school game, and, of course, chewing on it. 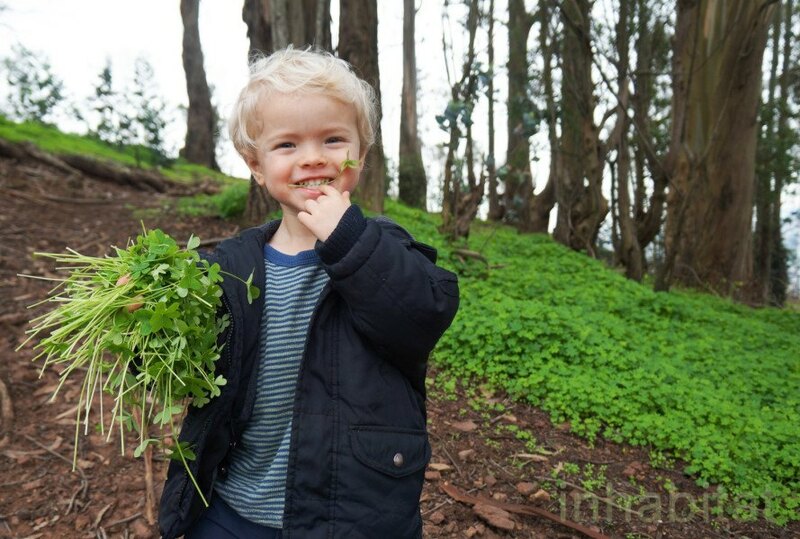 I am personally concerned about pesticide use on oxalis, mainly because San Francisco’s “sourgrass” is in my children’s hands and mouths on a daily basis, and I don’t want them ingesting cancer-causing pesticides. As soon as the weather gets warmer than about 70 degrees, which happens by April, the Oxalis withers and dies back until next season. So, what is the point – I would argue – of wasting money, time, and damaging our local ecosystem with poison, in order to wage a futile war against this useful, beautiful and clearly unstoppable plant. What are your thoughts on oxalis? Experience with this plant? I’d love to hear about it in the comments! This is a very interesting article but it provides zero information about the purported millions of dollars being spent. In the past few weeks, I have seen children picking oxalis or carrying around bouquets of oxalis. I pick up trash in my local park as a volunteer. Last time I was there I saw an abandoned bouquet of oxalis in the playground. Children and animals will judge plants according to the criteria that are relevant to them: Is it edible? Is it pretty? Adults are debating about theoretical differences that are meaningless to children and animals….and to many adults, including to me. Thank you for this informative article and for your work to reduce pesticide use in San Francisco. It is absolutely criminal to poison our parks, air, land, and water for any reason, but especially to kill such an exquisitely beautiful wildflower that is also edible. Unlike our native wildflowers who have been killed by poisons and people picking them, there is enough oxalis for people to collect and admire. I love our native plants, but oxalis is one of our most beautiful wildflowers and they bloom in the darkest, most depressing months without stopping. Only fanatics or those getting rich from the poison industry would kill them. Is it worth one more death from cancer, one more person disabled by chronic illness? Doesn't our government agencies have legitimate places to spend our money, like making our cities livable? Meanwhile the nativist hypocrites have their own non-native vegetable gardens, fruit trees, roses, etc. Most city, county, state, federal landscaping are non-native. Why the double standard? For those who want to eradicate non-natives, start with yourselves. Looks like the pesticide company is the only winner. My local sorrel is a much smaller plant, which I control in my yard by hand weeding and adding it to my dinner salads along with the other edible weeds that sneak in. Is the oxalis that is invasive in California a possible salable crop? Parking lots, and huge turfs such as parks and ball fields will be the death of milk, produce and beef. Pull your head out of your arss and realize the killing of wildflowers will continue to decimate pollinators. How do massive parking lots and ball fields effect our food chain? Alfalfa, dairy, beef, produce; correlation...Oh but dandelions and pretty little weeds are such a nuisance, you just have to have your lawn bright green and manicured. Pollinators are disappearing due to your wanna be status. St. Patrick's day is here, and with the plastic shamrocks popping up in stores everywhere, it got me thinking about the real plant, which grows everywhere around the world, and is under attack with a vengeance by the city government in San Francisco. 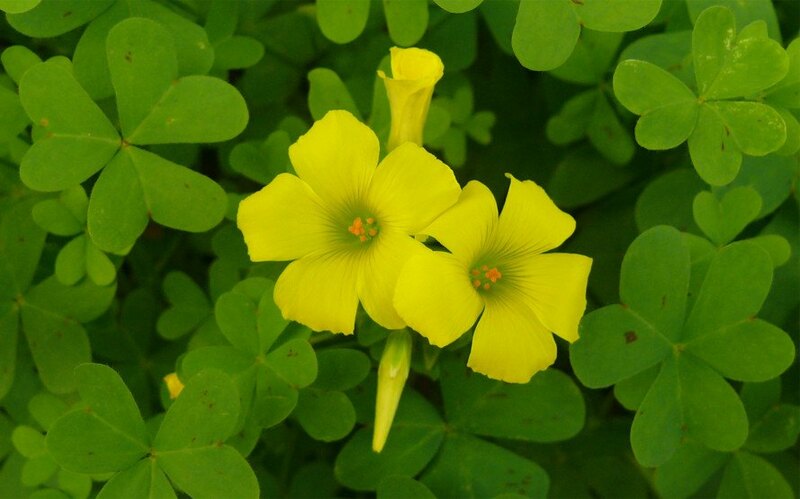 Oxalis, Sourgrass, Wood Sorrel, Bermuda Buttercup, Shamrock, and False Shamrock - these are just a few names for a genus of wildly prolific edible plants (aka "weeds") which grow everywhere around the world. Even if you aren't familiar with the name of this plant, you've likely encountered the clover-like leaves and pretty yellow wildflower of oxalis in a lawn before; it infiltrates grassy areas everywhere, street medians and even sidewalk cracks in cities ranging from New York and Cape Town to Sydney and San Francisco. Children love to eat it and play with it, and most school kids are familiar with "sourgrass". In January and February, entire hillsides in San Francisco burst in vivid yellow bloom with Oxalis flowers. Whether this is a problem or not depends on who you ask. Many San Francisco residents see the hillsides of bright yellow flowers as a beautiful first sign of spring, whereas others, especially those who espouse a nativist point of view, see this plant as an "invader" that must be stopped at all costs - even when that environmental cost includes dousing entire hillsides in dangerous pesticides such as glyphosate and triclopyr.